Capacitor is the building blocks of an electronic system used to store electric charges. In this tutorial we are going to explain you capacitor construction, how does a capacitor works etc. Before its working, it is necessary to have some knowledge of capacitor symbols and markings. As shown in figure below, it clearly is seen that the capacitor is usually constructed by using two or more parallel conductive plates which are separated from each other by an insulating material. This insulating material is known as Dielectric. 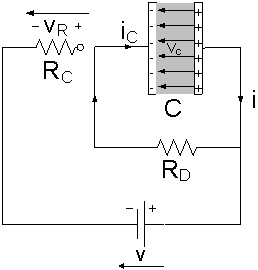 As shown, Capacitance is directly proportional to the area of the plates and inversely proportional to the distance between the plates indicates that the more area of plates and less distance between them will result in high capacitance value. So before capacitor construction always considered these two factors. It is the most important factor which affects the overall capacitance of the device. 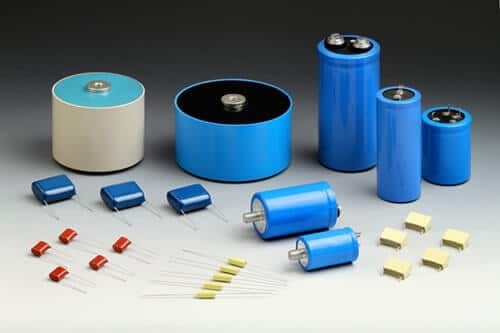 For different results, we prefer different types of capacitors because they all have different dielectric material between their conducting plates. The conducting plates of the capacitor are made up of metal foil allows the electrons to pass through it when it is excited by any power supply but the dielectric present between them obstructs the path of flow of electrons. The dielectric material is made up of a large number of insulating materials i.e. paper, mica, ceramic etc. When electric current starts flowing through the capacitor it got obstructs due to dielectric material present between the conducting plates of the capacitor. As a result, the charges got stuck to the plates of the capacitor. The negative charge in the form of electrons got deposited on the one plate of the capacitor and due to its large mass it pushes away the like charges to the other plate making it positively charged in the form of protons. As per the law, these opposite charges start attracting each other but when they come close to each other they got stuck on the plates forever due to dielectric present between them. The stationery charges on these plates create an electric field which influences electric potential difference and energy. In market different types of capacitors is available, you have to select suitable one for your work. When a capacitor is connected to a circuit with DC current source, the two processes occur namely charging and discharging the capacitor. When the capacitor is connected to the DC supply and current starts flowing throw it then the charging of capacitor begins. At the time of charging, both plates get positive and negative charges which further create the potential difference. The capacitor is considered as fully charged when the voltage at the terminals of the capacitor is equal to the supplied voltage. When this happens the current automatically stops flowing through the circuit, indicates that the charging phase is over. When charging phase is finished, the capacitor act as an open circuit to direct current and resistance value tends to infinity. 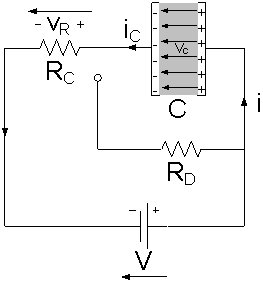 As shown in the figure below when the capacitor is disconnected from the power supply, the capacitor starts discharging through the resistor RD and the voltage between the plates drops down gradually to zero. It is the one of the factor which causes an error in applications based on charging and discharging of capacitors. Dielectric absorption known as soakage and studied for more than one hundred years is a well known phenomenon in capacitors which manifests as a slow recovery of a part of its lost voltage after the capacitor is completely discharged by shorting its terminals momentarily. It has its origin in the polarization and depolarization processes occurring in the dielectric material during the charging of the capacitor. The amount of dielectric absorption depends upon the property of the dielectric material present between the conducting plates of the capacitor and the residual charges obtained in our measurements provide a direct quantitative measure of this effect. With the help of this equation, you can easily calculate charge and voltage with the known value of any of the two. Like with a known value of charge and capacitance you can easily calculate voltage or with a known value of voltage and capacitance you can easily calculate charge. The dV/dt part of that equation is a derivative of voltage over time. With a known value of voltage and capacitance, you can easily calculate current. The big take away from this equation is that if the voltage is steady, the derivative is zero, which means current is also zero. This is why current cannot flow through a capacitor holding a steady, DC voltage. What is the working of capacitors in celling fans? A ceiling fan uses a single phase induction motor to run it. This motor is NOT self-starting i.e. it requires an external force to run it at the time of starting. This property of the single induction motor is explained by the double field revolving theory. To overcome this drawback, a capacitor is used. It is connected to a part of the winding in the fan motor. This creates a phase difference between the windings(one part with the capacitor connected and another part without the capacitor). Thus, a field is produced which is resultant of the two fields. The rotor rotates according to the direction of the resultant field. To increase the efficiency of the fan, the capacitor may be connected via. a centrifugal switch.